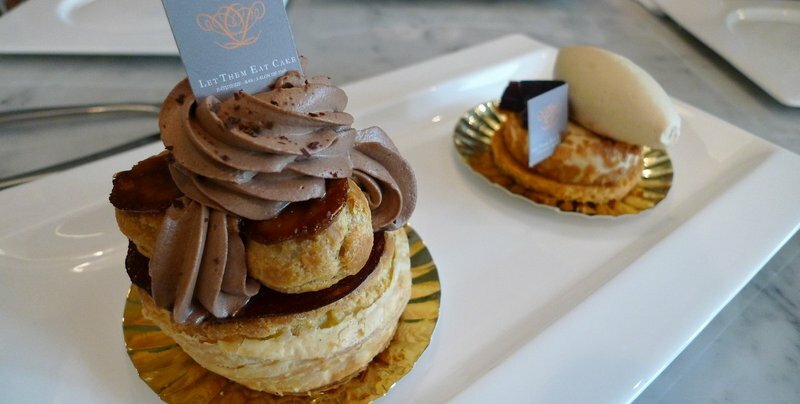 Not only is “Let them eat cake” the phrase commonly misattributed to Marie Antoinette, it is also the name of a cute patisserie and dessert bar on Sukhumvit Soi 20 in Bangkok. Dessert shops are plentiful in the City of Angels but most western style desserts are rarely worth the calories they contain. Let Them Eat Cake proves to be a delicious exception. Located in one of the “community lifestyle malls” – smaller, open air shopping centers that have sprung up across Bangkok like mushrooms after the rain – Let Them Eat Cake is charmingly decorated but a little small. Waits can get long at key times so come early or be prepared to wait. I am sorry to say that I don’t remember the names of each of the desserts we tried. I do know that this is a chocolate St. Honoré, an elegant combination of puff pastry, creme filling, and caramel. A tart of some sort with a scoop of vanilla ice cream. Don’t know if I ever tried this or just took a picture! A tarte au citron – lemon tarte. Was tasty but I found the crust a bit tough. 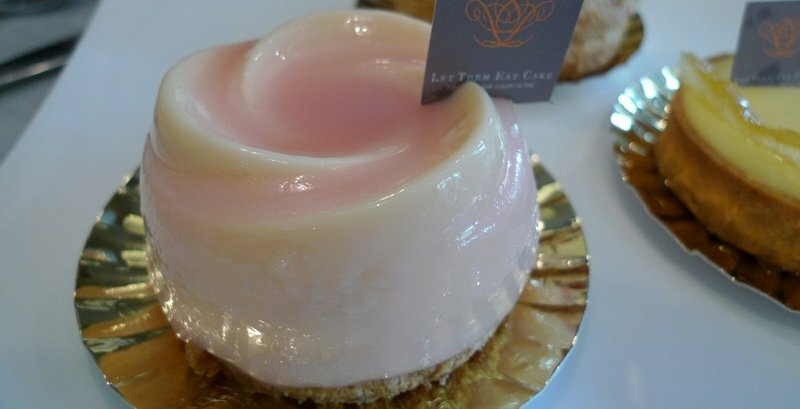 I don’t remember what this pink, rose-shaped dessert was. A gelatine and with something inside, I think. All in all, Let Them Eat Cake offered better, more authentic French style pastries than a lot of shops here in Bangkok. I look forward to my next visit and I promise to take more careful notes – and to sample a wider variety of desserts! This entry was posted in Uncategorized and tagged Bangkok, food, Krungthep, letthemeatcake, pastries, pastry, patisserie by christao408. Bookmark the permalink. I am not really into pastries but these do look interesting. I would certainly enjoy tasting some with a new cup of tea. Your photos are excellent. Lovely! I though I spotted a flan of some type in the first photo but no matter it all looks tasty. Oh my … so decadent. There is a similar store in my neighbourhood. I try to avoid walking in front of it. ooh I’m going to Bangkok in a few weeks, I wanna try these out! I am sure that cake was just as classy in its taste as the street with that name in Paris. so like i wonder how that place actually get any business? I mean, i would just stand and stare. I probably wouldn’t be able to bring myself to eat one. Dieters would hope that the place gets guilliotined but basically humans get a lot of temptations to fight. I wonder if you would rather go to France for pastries or the Netherlands? I would love to try these even though I don’t have that much of a sweet tooth. Oh my Oh my.I want every last bit of those. I find that the French and the Italian has one of the most creative cake baker/creator.Not only the cakes are tasting delicious, but they way they do the decorations are brilliant.Almost very artictic in some way! Just like the Japanese do.The Germans cakes I find to be boring, plain and sometimes too normal and dry too. Few cakes are good and I find others are as bad as their looks! LOLOh! The pink one does look yummy there. Delicious, I’m sure. I suppose one could buy only one and share it, cutting down on calories, but still having the taste experience. Difficult but doable. i love pastry establishments like these – they really do take the concept of food being art to the next level. i especially liked the gelatinous looking rose one. when i do go there, i will certainly try this place! The chocolate St. Honoré looks gloriously outrageous. i want them ALL. especially the lemon tart. YUM. that place would be the perfect spot for afternoon tea. quick question, how do they hold up in the Bangkok heat? @M_1 – Good question. I enjoy them indoors in an air conditioned environment. No need to expose them to the heat! @l0311879l – I wish I could recall what, exactly, that rose-shaped dessert was. I don’t even remember if it was a cake or a panna cotta type dessert, although that seems unlikely. @Sherrie_de_Valeria – Come to think of it, have I ever had a German pastry? Hmm… dunno. @PPhilip – Haven’t been to the Netherlands nor tried their pastries, so can’t say which place I would prefer to visit. @f5ye_angel5 – Those who stand and stare risk getting run over by those who are more quick about eating! @armnatmom – There are times I wish I could better resist the temptation of sweets. @radio03 – @Inciteful – @firetyger – @theartofsexy – @dawn_1o9 – @Grannys_Place – @ZSA_MD – @ElusiveWords – @awoolham – @murisopsis – @Fatcat723 – @chronic_masticator – @nov_way – Thanks for your comments. The shop could be renamed “House of Temptation” for all the gluttony it provokes! @isitreal_no – It is pretty far into Sukhumvit Soi 20 on the right-hand side. Part of a lifestyle mall called Mille Malle. Please let me know if you need any recommendations for your Bangkok trip. @christao408 – will do! I’m only in Bangkok for two nights and haven’t really googled anything at all so have no clue what I want to go see, or what I should see/do. What do you suggest?